Ballpark Basics: A modern twist on a classic ballpark. In the 1990’s the Red Sox had visions of replacing their beloved ballpark. 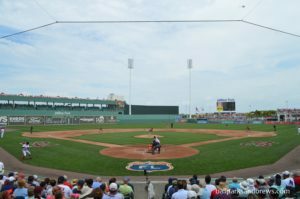 There were renderings created with a new Green Monster, but the classic park was preserved when Fenway went through a major renovation instead of a total destruction. 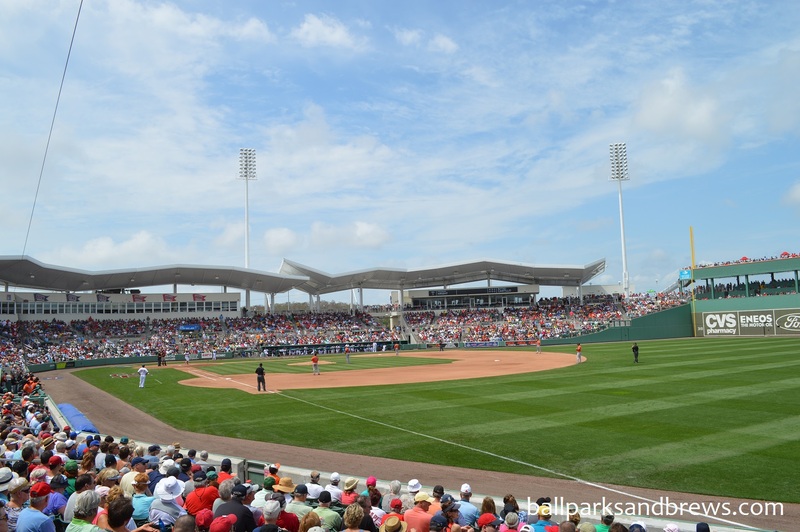 And, if you’re looking for a modern version of Fenway Park, all you need to do is head a little over 1,400 miles south to the Red Sox spring home, which is officially called JetBlue Park, but known to most as Fenway South. 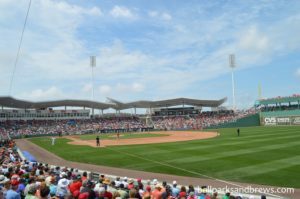 Built with essentially the same dimensions as Fenway, which even includes its own Green Monster and manual scoreboard, the Red Sox players must feel right at home playing on the field. However, that is where the similarities end with the 100+ year old inspiration from the north. 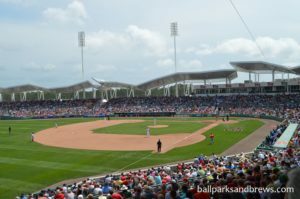 The building itself is is a modern take on ballpark design that is draped in white with four large canopies that cover most of the seating bowl. These are supposed to mimic the look of the cypress tree that surround the facility and give the ballpark a contemporary feel. 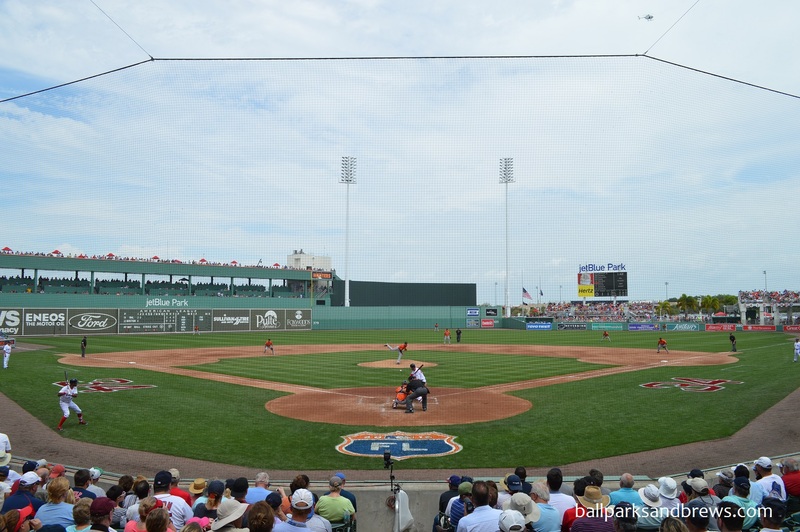 With a rabid fanbase it can be difficult to get tickets to their Spring Training games. We had to settle for standing room only seats and unfortunately other than the berm seating in the outfield there aren’t too many other places to socialize and watch the game. They have a few areas for groups like the Green Monster Deck and Pinchers Patio in the right field corner. However, these are only open to people with specific tickets. We were surprised at how few places they had for regular patrons to congregate and still be able to watch the game (especially in the shade). The popularity of the team also causes traffic backups getting into the parking lots so plan on getting there early. We ended up heading past the ballpark entrance and heading into an office complex just past the parking lots and saved a little money (and time). Best Spot for Beer: Outside of the ballpark they have set up large tents with one designated as the Food Pavilion and the other a Beer Garden. 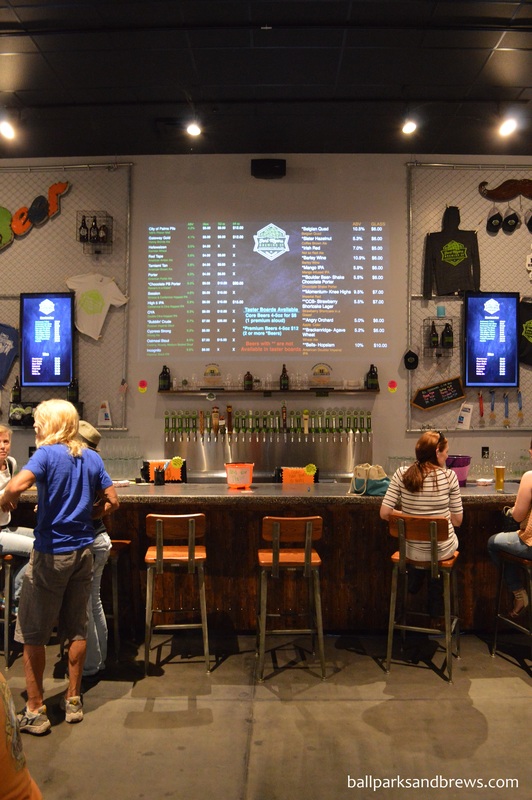 This has a small mix of local and craft beer and of course it has Boston’s own Sam Adams. 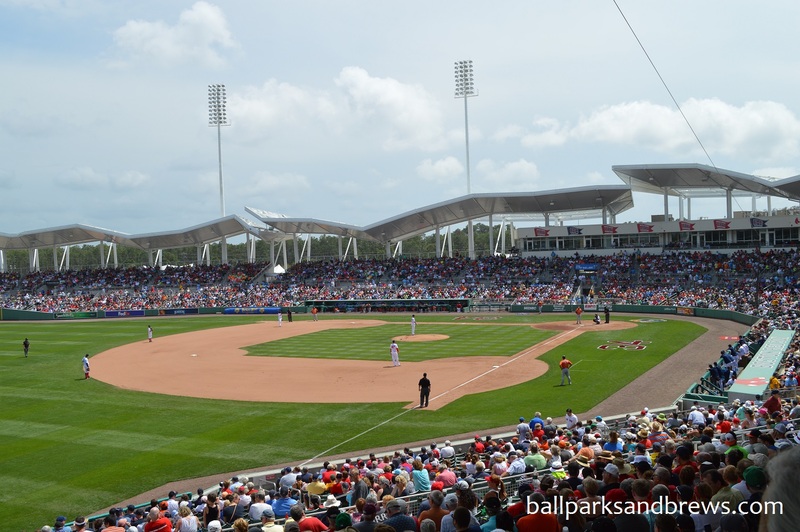 JetBlue Park is a great example of taking a historic park and putting a modern twist on it. While it can be a little disorienting at times to see the iconic Green Monster in a new setting, the ballpark as whole works. It blends the Fenway Park references effortlessly with the Florida architecture. Brew Basics: A good but confused place. 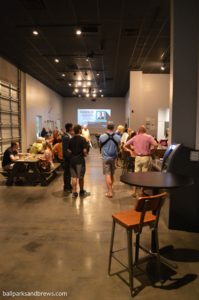 Fort Myers Brewing Company was hard to find in an industrial park, but sprawl and traffic confusion seem part of the deal in Fort Myers so we won’t deduct any points there. We ended up parking in what we thought was the front but had to walk such a good distance to get to the actual doors of the brewery that later, when the skies opened monsoon style and instantly flooded the parking lot, they let us sneak out through the back door of the brew works just to be a bit closer to our car and give our camera a fighting chance. Everyone was friendly, but there was a lot of confusion. Though still clearly a standard industrial space they’ve done a lot with what they have to work with as far as the tap room portion goes. 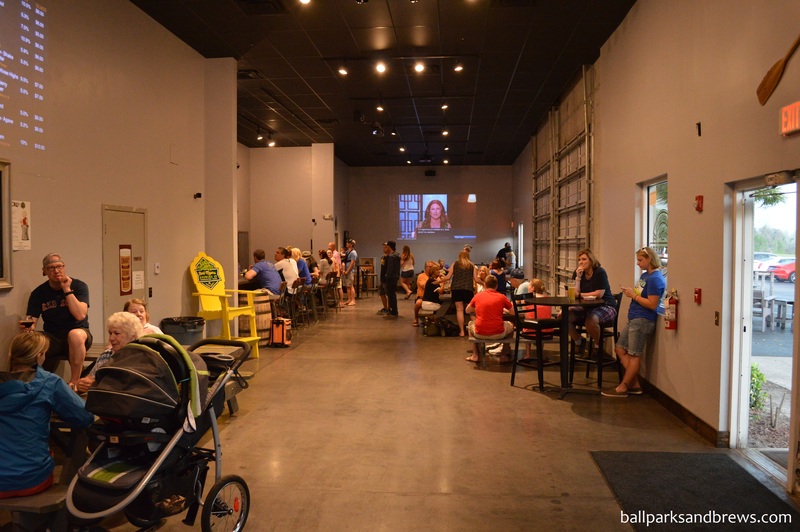 There’s a black stone bar, gray picnic tables, gray chairs outside and your standard assortment of board games and tvs (including a big one being projected onto the wall) for entertainment purposes. 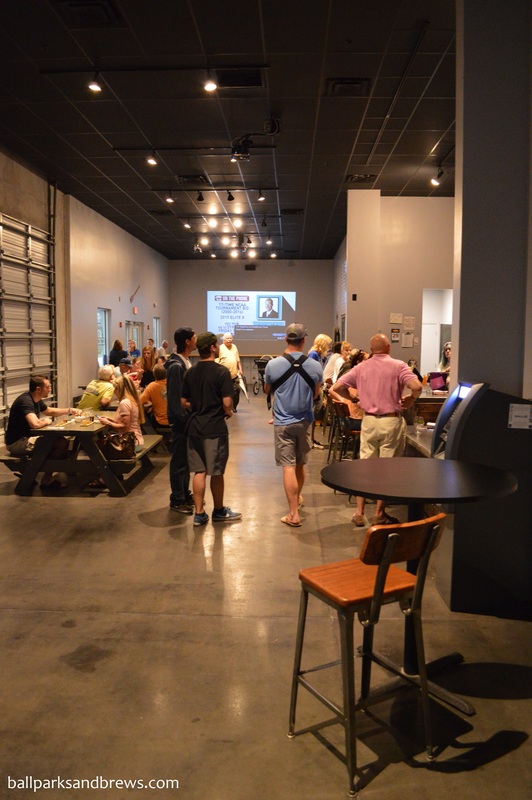 Along with six guest taps, FMB had many of their own offerings as well. Prices were noted, and some were marked with an asterisk, but as we ordered, the price on those changed from $8 to $12 a glass. No warning, and it affected several people’s beer orders since they were charged the higher price after ordering. Apparently the beer list and prices are adjusted nightly, and had been updated in the computer, but not on the menu boards. 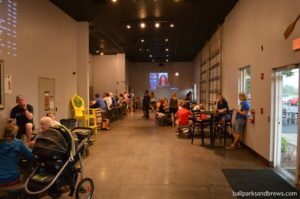 Despite these kind of issues, the bar was very popular – we arrived 10 minutes before normal business hours and they were already open, and instantly, steadily busy for the rest of our time there. Mango IPA (5.9%ABV) Orangey yellow and cloudy like fruit juice. The bouquet was also sweet but spiked like the punch at a high school dance. The palate was hoppy, tart and fruity all the way through and ended with a sweet mango juice finish. Tamiami Tan American Brown Ale (5.8% ABV) Light chocolatey brown color, with some pale orange notes. Chocolate malt smell and slightly bitter, tangy finish. As the Tamiami warmed up it maintained a thin mouthfeel, but caramel notes became more pronounced. Chocolate Peanut Butter Porter (6.0% ABV) Chocolate brown and traditional porter viscosity. The peanut butter aroma is strong, but clearly powdered in the taste, which is malted in the middle but starts and ends with strong peanut butter character. Oddly. This was the most carbonated out of any of the Fort Myers beers that we sampled. Incognito Imperial Black IPA (9.8% ABV) Similar chocolate brown color to the porter (not so black) but had a IPA/hop sour smell. Incognito is sweet up front with a bitter, tangy finish and the imperial adds extra raisin sweetness to the IPA. Overall we found the Incognito to be less smooth than others of this style, as it was still quite hoppy and sharp. Bubblin’ Crude Russian Imperial Stout (9.7%ABV) This stout poured a dark chocolate brown/coffee color. It had a creamy texture, and pretty serious smoke throughout. It aroma was overall smoky and roasted with some coffee notes, but not imperial or sweet with a dry, lingering finish.